Sculpture is about translating ideas into forms in space. It is a work of art that stands up, and can be viewed from all sides. 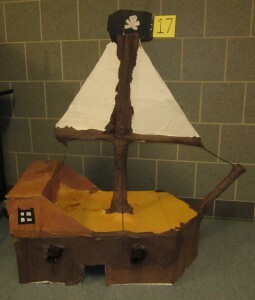 Students make sculptures out of clay, paper, papier-mache, recycled cardboard containers, pipe cleaners, and wire. 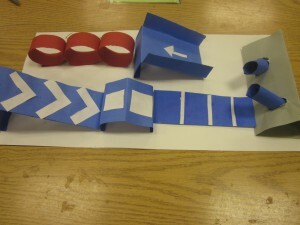 Paper can stand up, bend, fold, and connect, and paper shapes can vary in infinite ways. 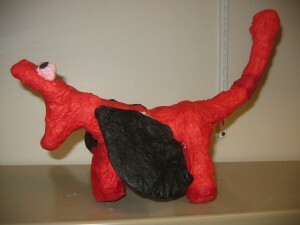 Papier-mache forms need to be built from the inside out. Cardboard containers have to be attached and balanced so they won't fall apart. 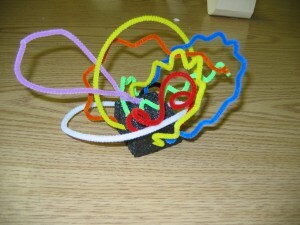 Pipe cleaners and wire can be lines that bend and move in space. 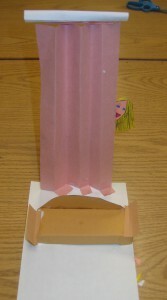 Students discover and learn effective construction techniques for each material that they explore. 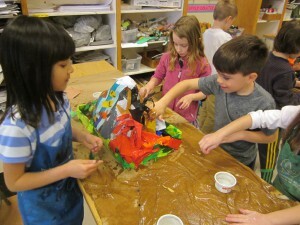 The challenge is for students to figure out their own ways to use the properties of each material in their sculptures. 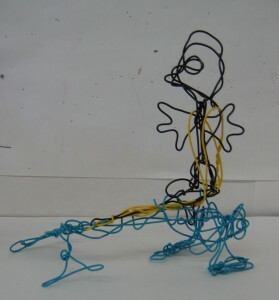 How will you get your pipe cleaners to stand up? Where will you use bumpy paper? Will you make parts attach? 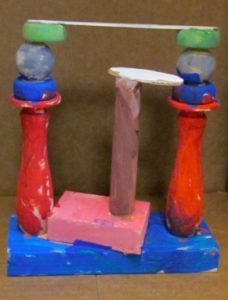 How will your sculpture balance? 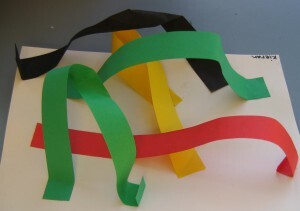 How is the paper different than the pipecleaners? What happens when you bend or fold the paper? Will it stay in place like the pipecleaners? How can you secure the paper and get it to stand up? What kinds of things might you see in a house? What rooms might be downstairs? Upstairs? In the attic? What might you see on the outside of a house? How will you make things stand up? Where will you place your items? 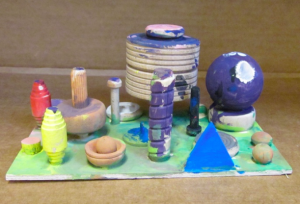 How will you combine small parts to make a bigger sculpture? How will you balance and support the parts? Where will you need to have surfaces connect? How can you make a paper strip stand up? What are all the ways you can make the strips connect? Bend? Fold? GO in different directions? 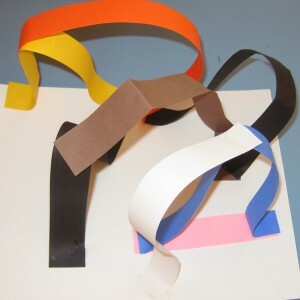 How can you get a zig zag or wavy line in paper? How can you secure the paper? Where will you put your strips? Will you attach lines to other lines? Will some strips go over and under others? 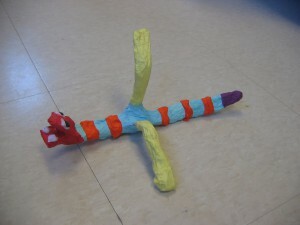 How will you make a sculpture using pipe cleaners, packing peanuts, corrugated paper and styrofoam pieces? How will you attach the parts? How will you get your sculpture to balance? What landforms are high? low? How will you create water areas? Shelters? High places? How will you work together so that everyone has a job to do? How will you use color to show us about the different landforms? 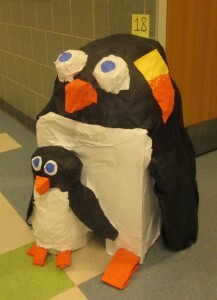 What details will you add with paper mache? What do you climb on? How will you get paper to stand up? Where will you be in the sculpture? What shapes do you need to make? How do the different parts function? How will you build and connect the different parts? What form is strong for the stem? 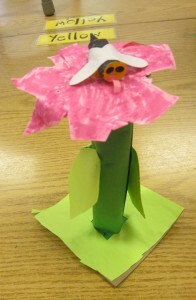 What pollinator will you create? Where will it be on your flower? What kinds of vehicles move? What kind of vehicle will you build? 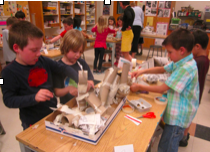 How can you use cardboard tubes, egg cartons and other recycled materials to create the parts? 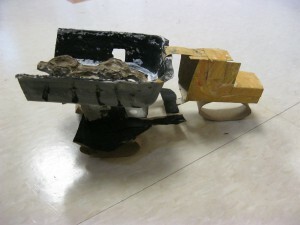 How will you combine the parts to make a sturdy sculpture? 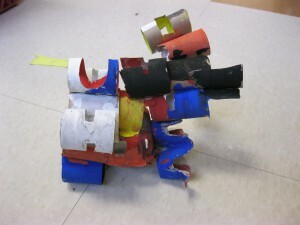 Using a toilet paper tube as a base, students are asked to add on features therefore creating something new. What animal will you make? What parts does your animal need? 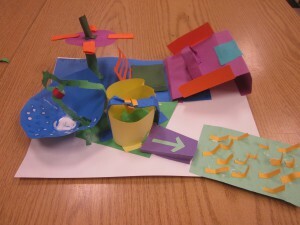 How will you create the forms out of newspaper? 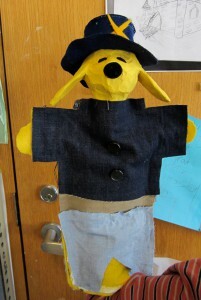 What kind of puppet character will you make? What kinds of newpaper forms will you need to make? What colors will you use to bring your character to life? 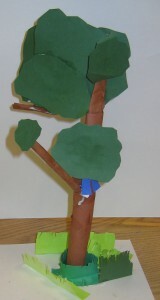 Students use their puppets during an in class show based on the principles of Open Circle. How will you get the paper to stand up? Which parts of your scuplture will be standing up? Will we be able to see all of you or just parts? The Challenge: each student gets one 9 X 6 newsboard, masking tape and as many 3 X 6 pieces of tagboard as they need. In 40 minutes they have to build the tallest structure they can. The Structure must stand on its own for 30 seconds with out any physical support. Every student approaches this project differently. Some sit and create a plan others dive right in. Most students find success until they reach a certain height. As they work students discuss ideas that work and problems they are having. The last 20 minutes is spent discussing as a class what worked what didn't and what we learned about engineering and building that we didn't know before. Students review the engineering principles that they discovered in the Tallest Structure Challenge. 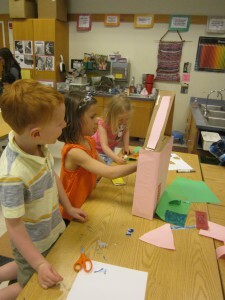 Their next challenge is to design a building by putting forms together. They What kind of building will you make? How the outside of the building can give people clues as to what is inside? What forms will you build? How will they be supported or connected? Students begin this lesson by creating a book of continuous line drawings. They are not allowed to lift their marker the entire time they are drawing the object. 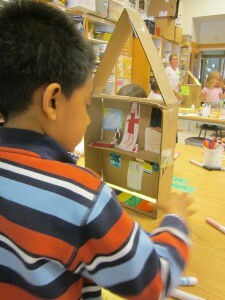 Each student is given the opportunity to challenge the class with an object of their choice. 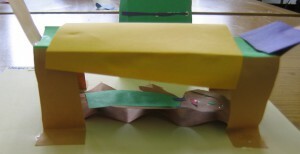 Different animals and objects are chosen by the students. 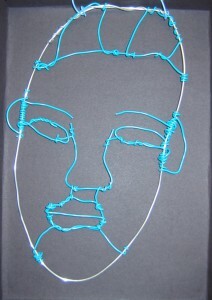 The students are then asked to represent one of their drawings in wire. How do you connect wire? How will you createthe shapes you need? How will you attach inside shapes? What kind of creature will you make? 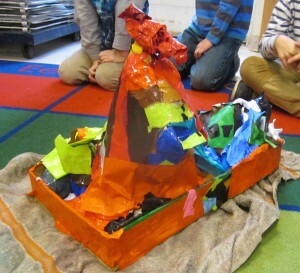 How can you form the tinfoil into the forms you need? What colors wil your creature be? Where will you overlap or add colors directly with tinfoil? What kind of obstacle might people need to get over? Under? Around? Will any parts be moving? What shapes do we see in our face? How can you make them from wire? How will you decide on an idea? What jobs will each person have? What forms will you need to create? How will you build and attach them? How will you create a path for the ball? What colors will you need?